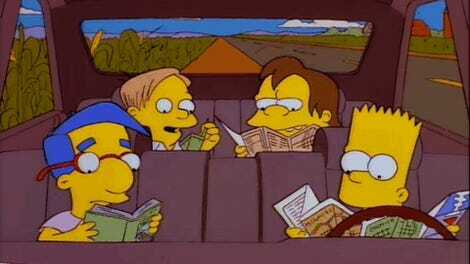 Remember the Simpsons episode where Homer was sent into orbit? It had Buzz Aldrin and James Taylor as guests, and gave the world the Overlord Meme. The episode was titled Deep Space Homer, and I have some serious questions and theories about the spacecraft featured in the episode, a strange spaceplane called the Corvair spacecraft. The episode aired on February 25, 1994, and was about a NASA project to re-ignite interest in the space program by sending an “average American” into space. Luckily for the show, that average American selected was Homer Simpson, and he was rocketed into orbit with real-life astronaut Buzz Aldrin and real-fiction astronaut Race Banyon. What interests me here, though, is the spacecraft that took Homer into space. When the episode aired in 1994, NASA was still launching the Space Shuttle orbiters into space on a fairly regular basis. These spacecraft were very well known to Americans, and visually they had a distinctive look that most American television viewers would recognize and understand instantly. You’d think representing the Space Shuttle as it was known to most people would be the way to go for the episode. For some reason, that’s not what happened. The spacecraft they used was called the Corvair spacecraft—the name is interesting to me as a car geek because, of course, it refers to Chevrolet’s infamous air-cooled, rear-engined compact car, which Ralph Nader famously claimed was “unsafe at any speed.” The name is also likely a play on Convair, the aircraft company. The Corvair was clearly a spaceplane like the real Space Shuttle orbiters, but that’s where the similarity ended. It was far smaller-seeming than an actual shuttle orbiter, about 1/3 the length, and was launched in a different configuration as well. Instead of being mounted to the side of the large central fuel tank and flanked by solid rocket boosters like the shuttle NASA actually used, the Corvair was mounted atop a large rocket with four strap-on boosters. It looked dramatically different than the space shuttles we knew, and I haven’t found any good justification of why the Simpsons artists and producers decided they should come up with a new spacecraft design. I’m not the only one to have wondered this, of course, but from what I’ve seen no one seems to really know why this decision was made. More interestingly, it doesn’t seem like a whole new spacecraft was just invented for the show; I’m pretty sure the Corvair was based on an existing spacecraft design of the time, the European Space Agency’s Hermes spaceplane. There’s a number of small ‘lifting body’ spaceplanes that look roughly like the Corvair that would have been known at the time, but the ESA Hermes seems to have the closest look, right down to the way it was designed to be launched on the top of an Ariane rocket. Hermes never got past the design stage, and the whole project was cancelled in 1992, two years before Deep Space Homer aired. Images of Hermes were pretty well known in the late ‘80s and early ‘90s, showing up in various science magazines and however the hell else we saw pictures of things before the internet. I remember encountering pictures of it in, I think, a National Geographic? Either that or one of those copies of Oui I used to find in the woods. The Corvair orbiter design is a dead ringer for the Hermes, right down to the turned-up wingtips and large conical rear section. Even the proposed interior layout of the Hermes seems to match what we see in the episode, though, to be fair, I guess it could also just be a pretty generic cartoon spaceship interior. There’s other contemporary spacecraft designs that could have influenced this as well—Japan’s space agency had the HOPE-X, there was another ESA project called Horus, and the Soviets had some similar-looking craft as part of their Spiral project, but none are quite as close as the Hermes is to the Corvair. Even if I’m almost positive the Corvair Spacecraft was based on the Hermes, that still doesn’t answer why The Simpsons decided to show Homer’s first trip to space as taking place in an aborted European spaceplane instead of the Space Shuttles that were so near and dear to American hearts. So, I don’t think there were any technical animation-related reasons why the look of the Shuttle was so different. 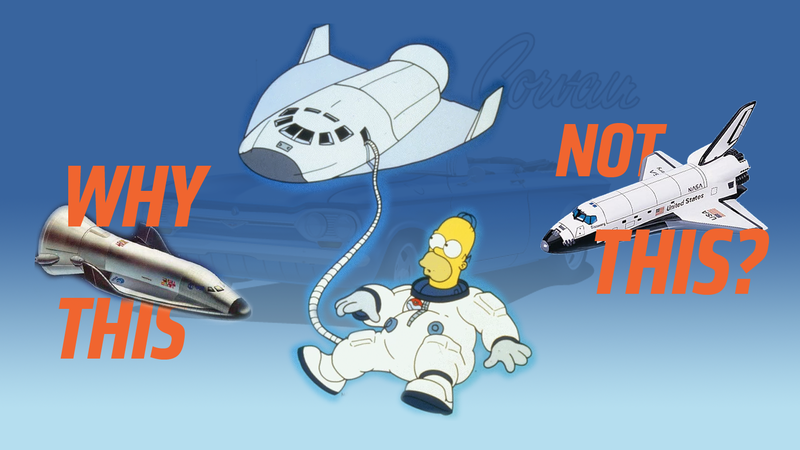 I think maybe the most reasonable answer is that, out of respect to NASA, the Simpsons art directors decided to make something visually different from the actual Space Shuttle, so they could give it a name like Corvair and have it fail in various ways without tarnishing the actual reputation of NASA. Perhaps NASA insisted that it look different? I’ve reached out to NASA to find out, and am attempting to reach out to someone who worked on the Simpsons during this period. If I find out anything definitive, I’ll update, because you have a right to know the truth. As of right now, this is still just a great Simpsonian mystery: the secret endorsement of a little-known European spacecraft design over America’s own Space Shuttles. I’ll keep searching for the truth. UPDATE: Well, hot damn. David Mirkin, the writer of Deep Space Homer (and he created Get A Life, the wonderfully underrated Chris Elliot show) actually tweeted the answer I’ve been desperate to know for over two decades! I’m so happy to finally know the answer. Thanks, Mr.Mirkin! I liked your shuttle design, too, even if I’m still pretty sure you cribbed it from the Hermes. I won’t tell.